Singapore’s shipyards are looking to recent investments in capacity, design and newly acquired technology to combat order declines after a decades-long offshore buildup. Sembcorp and peer Keppel are making the most of partnerships in FLNG and showing signs they’ll be okay through the downturn, helped by their gas-hungry Australasian backyard and renewed ties with old charterer parties and suppliers. With drilling contractors unable to pay for the offshore rigs they’ve ordered, Singapore’s heavyweight yards have had to defer deliveries and become defacto rig owners. Yet, despite eating through their orderbook — including two newly delivered floating production storage and offloading vessels, or FPSOs — Keppel’s Offshore & Marine Division is staying profitable in the downturn, earning $20 million in 2016. “The painful but necessary measures to right-size our (Offshore & Marine) division must continue,” Keppel Corp.’s chief exec, Chin Loh Hua, says for the record. After delivering a rig for Seadrill, Sembcorp, too, is agreeing to delay a rig handover, and if its client doesn’t find work for the finished semi-submersible and Sembcorp fails to sell it, then the two charter parties will do that by joint venture. “Their agreement to more or less jointly own the rig works pretty well,” says Danske Bank Markets offshore analyst, Sondre Dale Stormyr. He adds that rig giant Seadrill’s more public conflicts have mostly been with Korean and Chinese yards. Troubled clients aside, the pace of work has been brisk for both yard groups. Keppel — which has just sold a client’s jack-up rig at 80 percent of its build cost — in January 2017 finished the build and integration of topside modules on the P-66 FPSO for a Petrobras-led consortium. Work on FPSO, P-69 is progressing well and follows similar conversion work for Italian ENI and Yinson that was Keppel’s 125th FPSO customization. A fifth-generation offshore accommodation unit — Keppel’s own design — was handed over to Floatel International for a Chevron work at the Wheatstone field off Western Australia. Another housing semi-sub is understood to be in the works at Keppel’s Caspian yard. To be sure, rig orders have dried up. “You need a contract (with an oil company) and more” says Stormyr about financing anything for the yards these days. Not waiting for rig finance, Keppel FELS managing director Chris Ong is leading his build-and-repair network of 20 yards through the high-spec rig glut and into the new Keppel businesses. “There’s a steady stream” of work for the repair segment, Ong is quoted in a regulatory filing as saying. As with Sembcorp, there’s a Keppel focus on the fledgling FLNG market, a belief in which is aided by Asia’s dearth of gas pipelines. Keppel Offshore & Marine CEO, Chow Yew Yuen, can count on FLNG conversions (three and counting) to add to the “old” business of FPSO conversions and builds of topsides and turrets. A new lift-boat design for wind and platform maintenance and new, versatile, low-cost jack-ups for inspection, maintenance and repair, or IMR, intend to convert some “old business” into contracts for this cost-conscious era. In 10 years, Keppel has built mostly semi-submersibles (40 percent) and floating producers (25 percent). But in financial statements, Yuen points to FLNG conversions and IMR jack-ups as the promising technology behind a group-wide LNG push which made Keppel part of a new “gas value chain”. Sembcorp’s drive includes offshore liquefaction and LNG carrier knowhow that bears the mark of Norwegian engineers from Aragon AS (formerly Kanfa Aragon) and their “nitrogen expander” Dual N2 technology. It seems the Norwegians with their 50 percent of Aragon might put it aboard FLNG newbuilds across Asia. “The global FLNG market is expected to draw US$65 billion of investments from 2014 to 2020,” Yuen said in 2015. In February 2017, after a successful USD100 million fundraiser, another company, FLEX LNG, told an Oslo audience that LNG carriers without contracts are increasingly rare, so there’s room for newbuilds. FLEX will build theirs in Korea, where Baltic shipping and LNG interests are building a large LNG bunker carrier in 2018. Sembcorp’s LNG buttress against offshore headwinds strengthens in 2017 with the arrival in March of new Group chief exec, Neil McGregor, former CEO of Singapore LNG Corp. In a note to shareholders, Sembcorp notes McGregor is “the architect behind the strategy and implementation of Singapore’s first LNG Terminal”. While Golar FLNG kick-started Keppel’s FLNG drive, Sembcorp’s initial LNG growth drive has been acquisition-based so far, kicked into gear via marketing and then ownership stakes in rising FLNG stars. There’s also a move into smaller scale LNG shipbuilding linked to a deal with Shell to build LNG-powered vessels of all types. Sembcorp’s new LNG business will be built on a slew of designs from recently acquired LMG Marine and Aragon. There’s also a memorandum of understanding with ENGIE to develop GRavifloat, an LNG-to-power near-shore terminal solution. The Gravifloat agreement means Sembcorp aims to design and deliver re-deployable terminals for near-shore gas and power installations that compete with LNG and re-gassing tech on costs. The 50-percent stake in process design engineering assemblage, Aragon, could help here, too, while giving Sembcorp the ability to deliver offshore and nearshore FLNG. A deal for all the shares in international floating producer designers LMG Marin of Bergen Norway rounds out Sembcorp’s interest in pushing FLNG. LMG has designed LNG carriers, LNG-powered ships and the Espasdon drillship design, a Sembcorp deliverable. While FLNG looks promising, it isn’t clear which business activity — rigs and floaters, repairs & upgrades, platforms, and shipbuilding — will best help Sembcorp and Keppel until the expected offshore upturn. Sembcorp, meanwhile, is still bringing in high-margin “conventional” offshore business. Recent work includes the Maersk Highlander jack-up for the Culzean field development in the U.K. North Sea and the Ivar Aasen process, drilling and quarters (PDQ) platform topsides. The rig was a “little sister” to Maersk’s other rigs and marks a trend toward lower-cost units. The billion-dollar topsides were the biggest award of its kind in Sembcorp’s history. Yet, as we write, Sembcorp at its flagship Tuas Bolevar shipyard is laying out the world’s largest crane vessel, a 220-meter-long giant, for Heerema. Tuas offers massive, highly automated steel fabrication that Weng Sun says made possible the bids for Culzean, newbuild floating producers and the Heerema semi-sub. Despite the new work, communiques from Sembcorp leadership is keen to point out when new work is “non-drilling”, a nod to those extra rigs. Keppel, meanwhile, will grow its LNG business with dual-fuel LNG tugs and cooperation with Shell on new uses for LNG as fuel. There’s a growing list of potential FLNG projects to bid on, including the recent “okay” announced by Eni at the Coral FLNG project offshore Mozambique. If Coral goes, Eni’s long relationship with Singapore on FPSOs will be pitted against field partner Kogas’s national links to the Big Three Korean yards. Meanwhile, Keppel, like Sembcorp, will look to its other orders, including work of a new type: a multi-ship dredger order worth $73.6 million for Dutch Jan de Nul Offshore. 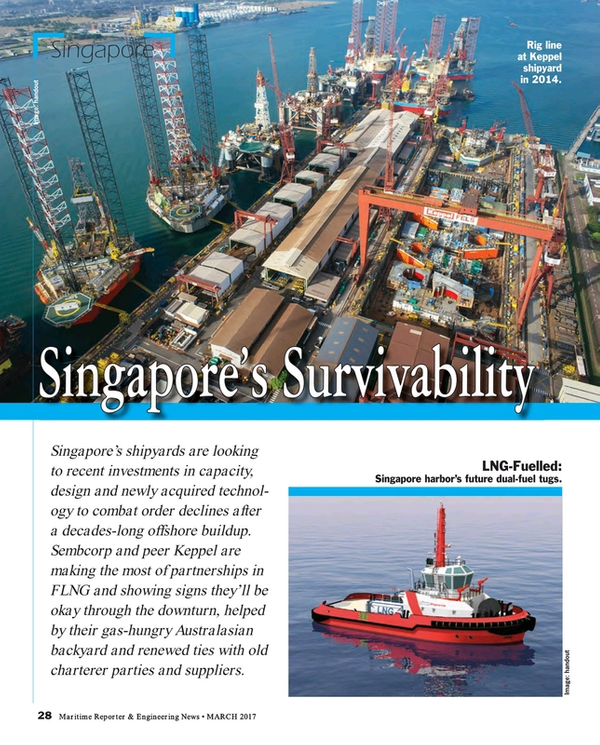 For Singapore’s Keppel and Sembcorp, the downturn is about their own and others’ long-term bets on FLNG and whatever shipbuilding, repair and conversion work turns up.